Move through the rock cycle doing activities for each stage. Materials in the activities, plus a piece of (local) sedimentary rock e.g. sandstone, ideally showing layers and a piece of (local) larva rock e.g. basalt. Draw mountains on the board. Discuss, while adding to the drawing, how they are weathered and wash particles into the ocean which build up in layers on the ocean floor. Start the sedimentary uplifting activity, stopping after students have made their layers in the tray. While they do this, circulate with a piece of sandstone or other sedimentary rock, to show the layers. Students can feel the graininess of the rock but see that it has been so compressed that the layers are welded into a solid piece of rock. Referring to the rock cycle drawing, and adding to it, tell students that a couple of things can happen to these sedimentary layers. They can be pushed deeper into the earth, where they are compressed further into metamorphic rock. If they are pushed even deeper towards the molten centre of the earth, they heat up enough to melt. Melted rock is called magma. Some magma comes to the surface fast when a volcano erupts, and cools rapidly on the surface to extrusive igneous rock. Optional: show basalt, a local extrusive igneous rock. Other magma moves more slowly upwards inside the earth, so that it cools slowly to form intrusive igneous rock. As it cools, there is time for the different kinds of mineral molecules to organize together to make crystals. Students make crystals in a painting, and (hopefully) notice them forming. Collect the epsom salt solutions and the paintbrushes, but leave students with the flashlights and distribute granite rocks to study. Ask students to find the crystals in the granite and what colours they are. Write the colours on the board. Arrange the colours into the three mineral components of granite. These three minerals cooled slowly enough to make the large crystals that they can see in their granite. Circulate with mica, quartz and feldspar, the mineral components of granite, so that students can see these colours in their rocks. Referring back to the board, review how different kinds of igneous rocks are formed. The sedimentary layers can take another route in the rock cycle, being pushed back up to the surface of the earth (as tectonic plates move together) to uplift into mountains. Students return to their sedimentary uplifting activity, to push up the sedimentary layers, and draw class results. Show students images of sedimentary rock formations. 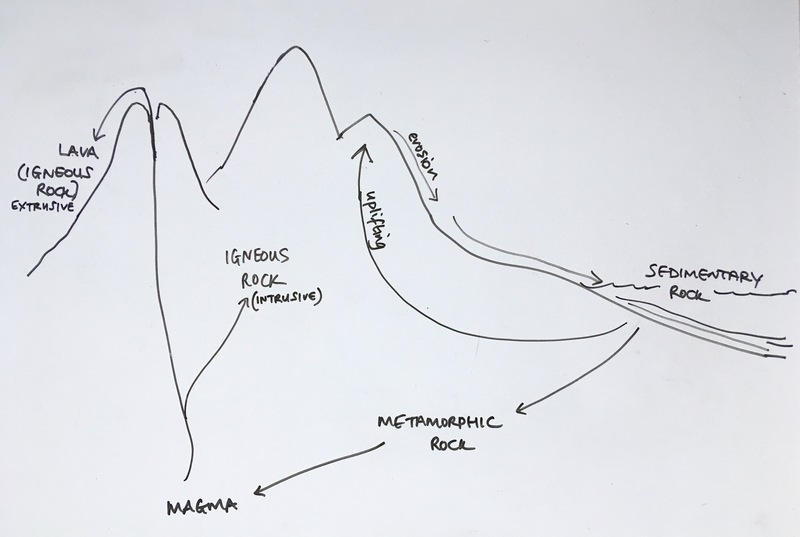 Referring finally to the rock cycle drawing, review how the sedimentary rock cycles, and add in that the igneous and metamorphic rock can also be pushed up to the surface to then be eroded back into the ocean. Some activities the same as the sedimentary rock cycle lesson plan.